PapaWheelie, our resident Formula 1 racing expert, is back in the house with part 2 of his F1 state of the union address. In the previous post, we took a look at the sharper end of the F1 stick. This time we are going to catch up with bottom six teams. Paul di Resta looks to keep his momentum going after the break. 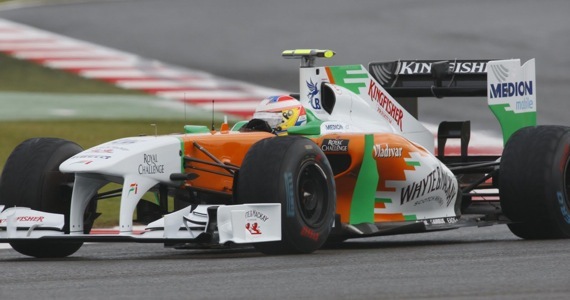 Strong performances in pre-season testing, as well as the advent of the highly rated rookie Paul di Resta left Force India with some big shoes to fill following their 2010 campaign. The VJM04 is a progression of their 2010 car, but it failed to really exploit the “blown diffuser” regulation loophole that many of the top teams used to their advantage. Adrian Sutil has shown a lot of promise as a driver throughout the years, but has never been in a car long enough to really show just how quick he is, and he’s now again in danger of losing his seat. Teammate and rookie Paul di Resta came to the series with a lot of speculation on how he would do, and it seems that gamble has really paid off, big time. Being consistently quicker than his teammate, and scoring some good points over the first half of the year just may seal the rookie of the year award for di Resta. Expect Force India to be strong mid-fielders, and maybe even a monkey wrench for the top teams for the rest of the year. Sebastien Buemi is looking to keep his spot in the driver’s seat among building pressure. 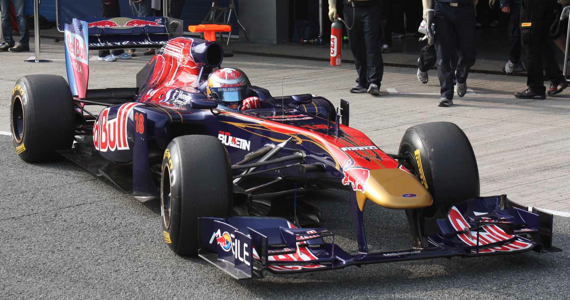 Toro Rosso has had an interesting year to date, even though their points don’t really say so. Both Sebastien Buemi and Jaime Alguersauri are fighting to keep their seats against Red Bull rookie and 3rd driver Daniel Ricciardo, or even to be considered as a future replacement for Mark Webber at Red Bull. That said, the pressure has produced some pretty exciting racing from the Toro Rosso duo. They were tipped to be stronger this year with an innovative double-floor design to the car, but the team has been largely unimpressive in qualifying. Their race pace has shown promise, but they can’t seem to put it together quick enough in a weekend to challenge the top five teams. Unless they can make some serious upgrades to the car, they will be fighting with Sauber, Williams and Renault at best, and could easily be upset by a smaller team if they’re not careful. Despite an impressive pre-season, Rubens Barrichello has struggled this year. Another marquee that brings back images of the glory days with Ayrton Senna, Nigel Mansell, Damon Hill, Jaques Villeneuve and many more great drivers, Williams has really fallen on hard times this year. 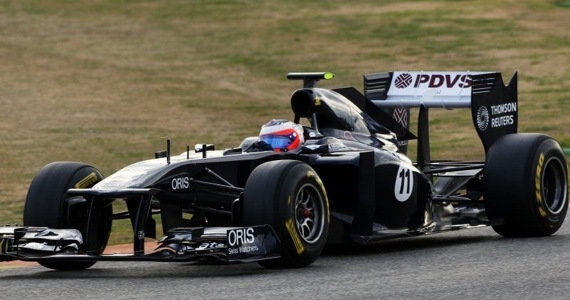 2009 championship runner-up and long-time veteran Rubens Barrichello had shown real promise in pre-season testing, but has struggled to get a handle on the FW33, which is proving to lack quite a bit of performance then what was previously shown. Sacking Nico Hulkenberg after a promising 2010 rookie season in favor of 2010 GP2 champion and pay-driver Pastor Maldonado seemed like a questionable move from the start. Suprisingly, Maldonado has shown decent consistency in his race weekends, and has a pretty cool head when it comes to pressure. Financially struggling for a while, Williams had opted for an IPO of the team on the Frankfurt Stock Exchange in hopes that they could gain valuable investors to propel the team to being competitive. Hopefully we’ll see in-season testing make a return for 2012, and some much needed capital so that Williams can regain it’s place among the top teams. Until then they will continue to struggle quite a bit with the teams at the back of the field. Heikki Kovalainen has dominated team Lotus this season. The first of the three newest teams in F1 has consistently shown that it’s the best of the new blood. A solid development plan and a committed and highly professional crew has put this team on track to start challenging better, more established teams, as well as closing in on points scoring positions in only their second season. Backed by a Malaysian consortium and headed by Air Asia boss Tony Fernandes, Team Lotus promises to close the gap on the midfield, especially by the next set of rule changes to take place in 2014. Former Mclaren driver and Lewis Hamilton teammate Heikki Kovalainen continues to dominate Lotus as far as performance and will more than likely do so for the rest of the year. F1 veteran and 2004 Monaco race winner Jarno Trulli has struggled to match Kovalainen, and was sidelined in favor of test driver Karun Chandok at the German Grand Prix. Although expected to keep his ride for the rest of the year, he’ll more than likely step aside for Chandok one more time at the inaugural Indian grand prix. Beyond that, unless he shows why he’s supposed to be there with Team Lotus, he’s likely to be dropped at the end of the year in favor of a stronger teammate. 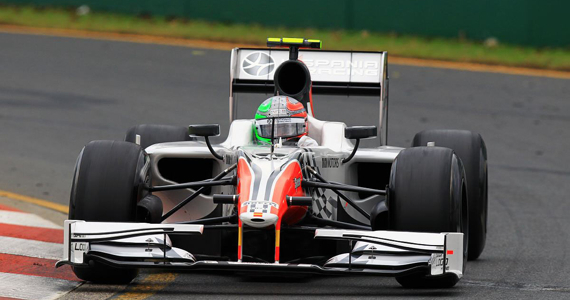 Vitantonio Liuzzi and all of HRT have continued to struggle this year. After having an atrocious first year in F1, HRT continues to struggle both financially and with their development. Rumors of buyouts, change of management, and general financial unrest have plagued the team since its inception and heavily affect how the team is progressing. 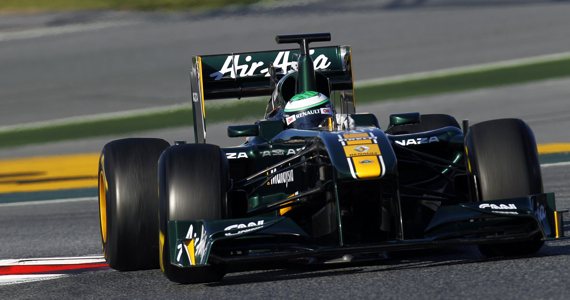 Regular drivers Vitantonio Liuzzi and Narain Karthikeyan have shown little progress with a car that was a continuation of their hugely unsuccessful first season. Although unable to consistently challenge Team Lotus for track positions, HRT is moving ahead of Marussia Virgin for overall pace. Highly esteemed rookie Daniel Ricciardo has replaced Karthikeyan for the rest of the year in a development deal with Red Bull, although it is highly expected that he will move to Toro Rosso for 2012. Ricciardo has been proving to be competitive with Liuzzi and helping the team stay ahead of Virgin for being dead last on the grid. 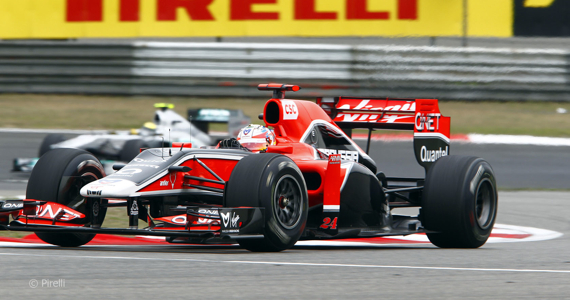 Timo Glock and his team are trying very hard to not finish last this season. Currently in a fierce battle with HRT for the slowest cars on the grid, Marussia Virgin is getting better, albeit very very slowly. Following lots of personnel changes and a deal with Mclaren to help technically develop the car, Virgin has all but abandoned their highly controversial car design method, based purely on Computational Fluid Dynamics, and has moved to a more traditional method of development with testing and driver feedback. Unlikely to see any real gains this year, Timo Glock and Jerome d’Ambrosio will continue to struggle throughout the rest of the season to not finish dead last on the grid. 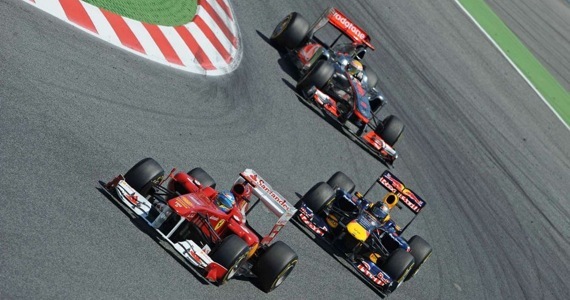 Seven races are left for this year, which definitely looks like it will be another year of the (Red)Bull. There are likely to be many surprises for second half of the season, not to mention a hugely intense battle for second place in the drivers and constructors championship. The new tires and technical regulations have played havoc on how a race can be won or lost, and the weather has also really turned out to be a big factor on many of the circuits. It definitely feels like this year is not so much about where the journey is going, but how the racers will get there. Expect a lot of action in the weeks to come.